When I tell you that this is the world’s best cookie I am willing to concede the point that perhaps it’s because it has so many wonderful memories attached to it. The recipe is from my late aunt. She referred to herself as Auntillie, while her daughters and I noted her extra-special-ness by calling her Tillie-Next-To-God. It’s improbable to state that something in life always happened, and at the same time it is true to say that Auntillie always had a batch of kamish in the cookie jar. I have very fond memories of not just eating these cookies myself – always– but of watching her sit down with a cup of tea and two cookies whenever I visited. This particular cookie, popular among Eastern European Jews, goes by various Yiddish-ie names, kamish bread, kamish broit, mandel bread, and mandel broit. For the rest of the world, let’s just call it Jewish biscotti. Like biscotti, it is a twice baked cookie with a crunchy exterior, a dessert that keeps for a long time and that easily gets eaten before it gets stale. Beyond childhood memories of raiding Auntillie’s cookie jar, I also lived upstairs from her as a young married person. She owned a duplex; we rented the upstairs. There was a back staircase in the building that she used to deliver bowls of freshly baked kamish. A light tap at the back door was the code for cookies. When I moved away from that duplex, and from St. Louis, she would always send a tin full of kamish to me whenever my parents came to visit me in California and then in Ohio. Many years passed, taking with them beloved Auntillie and my mom. When my dad started to decline physically we moved him from St. Louis to Cincinnati so I could look after him. Aching over pulling him away from all the memories of home, I yearned for something, anything, to fill the void. That’s when I hit upon the idea of baking kamish for him. Since Auntillie was Dad’s sister, his love of her cookies was decades older than mine. We baked those cookies in September and Dad died in October so quite frankly, I’m not sure that he was well enough to enjoy them, much less get the emotional lift I had hoped for. BUT, the making of the cookies was an emotional lift for me. 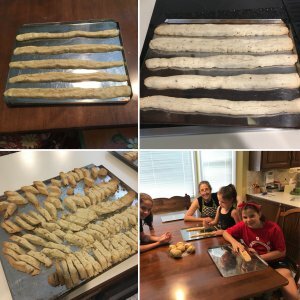 And because I now associate baking them with my dad and with my beloved aunt, young Tillie and I – and her two sisters – platch annually, every September. Hence the always wonderful cookies become more wonderful with the passing of each year. cookies after the second bake, and the platching team. With the blessing of Auntillie’s daughter, my cousin Loie-next-to-God, I share the recipe now. When you gather up your ingredients, also gather up your best friend, favorite sibling, oldest grandchild, kindest neighbor, or similar special person to help with the baking. Call your cooking day The First Annual Kamish Baking Event and then be sure to repeat annually. Lovely and loving article – so well put. And I’ve copied the recipe, so I intend to take your advice! Thank you, Ellen. You are such an accomplished writer that your feedback means a lot! But in return for great feedback, you now have a great recipe. I hope you LOVE it. Aha, mother to young Tillie. Thank you. The recipe makes about 200 cookies and in spite of that fact, there are none left over to share. I’ll owe you some. I feel extremely fortunate to have known your Aunt Tillie who was such a cute little thing! Also, I absolutely remember enjoying her Mandel Broit at various family gatherings. Do you eat them with tea/coffee/milk or all three????? Can’t wait to make them. Hi Wendy! Auntillie dipped hers in tea, I believe. I dip mine in nothing. Just eat them by the handful! 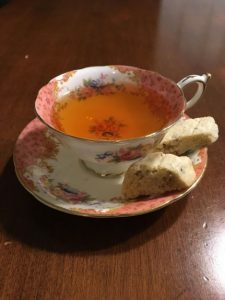 By the way, the tea cup in the photo was Auntillie’s, so it is very special too.